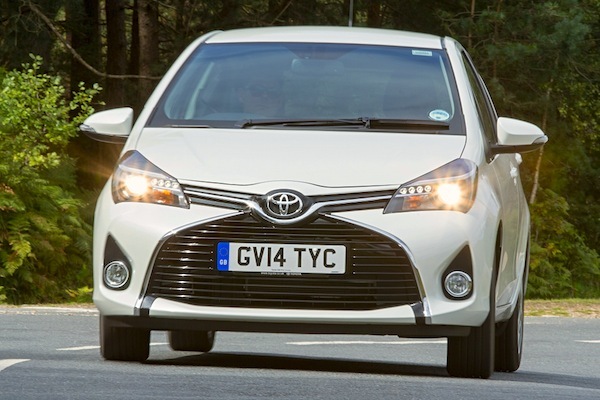 The Toyota Yaris is the best-selling vehicle in Ireland in June. Now that Ireland functions on a bi-annual license plate change like the UK, June has become of the weakest month of the year. In 2016 the Irish market is up 12% but at 1.625 units it is still a drop of water in the ocean. Year-to-date, it now amounts to 101.338 sales, up 23% on the same period in 2015. Toyota takes the lead of the brands ranking thanks to volumes up 21% to 317 and 19.5% share above Volkswagen (-18%), Hyundai (+126%), Ford (-25%) and Kia (+62%). Mercedes (+152%), BMW (+100%), Renault (+138%) and Suzuki (+400%) also post significant gains. Toyota spectacularly places three models on the June Irish podium: the Yaris, Corolla and Auris in this order. But the Hyundai Tucson, #4 this month, remains by far the #1 in 2016 with 5.131 sales vs. 3.696 for the VW Golf at #2. Full June 2016 Top 35 All-brands and Top 170 All-models below.